Answering “No” to one or more of the following questions suggests you would benefit from a partnership with the Baker Group. The term Enrollment Management (EM) describes an integrated, school-wide process that consistently guides the annual recruitment, enrollment, and retention of mission-appropriate (best-match) students in sufficient quantity to ensure the current and future financial well-being of a school. 1. Are all members of your internal and external constituents clear about your school’s unique mission/distinctiveness? 2. Do administrative offices at your school communicate regularly and efficiently with regard to matters related to admission of new students and the retention of currently enrolled students? 3. Is your school’s leadership and faculty currently satisfied with the school’s composition in the following categories? Gender? Day? Boarding? Geographic diversity? Cultural diversity? Economic diversity? or Academic quality? 4. Does your school community benefit from organized volunteer efforts of current and past Parents and alumni? 5. Does your school challenge and support all students to develop their academic potential to its fullest while preparing them to be independent, motivated learners and contributing members to their communities? 6. Does your school regularly communicate detailed student performance data to members of your school leadership team? 7. Has your school conducted research of current parents, students, faculty and other constituents to assess their perceptions of and levels of satisfaction with your school? 8. Has your school assessed whether your current families perceive their child (ren) are receiving “value” for the cost of education? Has your school measured the impact that tuition expenses are having on family lifestyle? 9. Do your school’s marketing efforts effectively support your admission and enrollment goals? 10. Is your admission evaluation system the best predictor of student success at your school? 11. Does your leadership team and faculty understand the economic and demographic changes that have occurred in your school’s market in the past 5-10 years? 12. In a rapidly and constantly changing market, does your school have a clear vision for its’ future and a strategic plan for reaching its enrollment and school composition goals? We hope we have inspired your thinking that research on these enrollment management questions can provide answers to some of the most difficult issues facing school leaders. 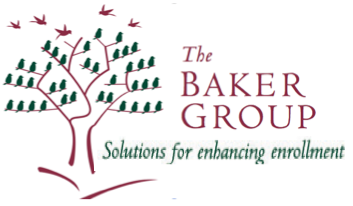 Speaking to someone from the Baker Group could begin a partnernship that will benefit your entire school community. Let’s discuss the questions you answered “no” to and help you plan ways to address them. Contact the Baker Group. Return to Enrollment Management page.